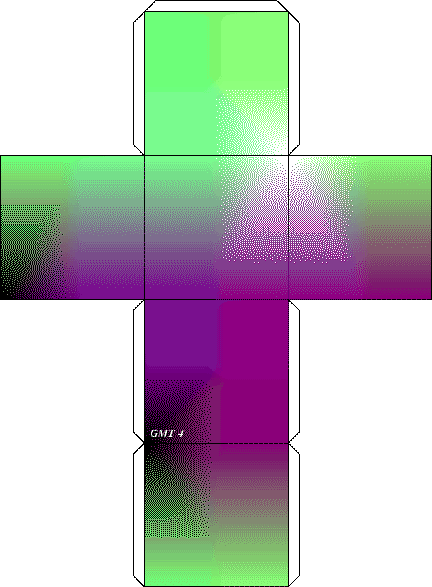 In this example we generate a series of 6 color images, arranged in the shape of a cross, that can be cut out and assembled into a 3-D color cube. The six faces of the cube represent the outside of the R-G-B color space. On each face one of the color components is fixed at either 0 or 255 and the other two components vary smoothly across the face from 0 to 255. The cube is configured as a right-handed coordinate system with x-y-z mapping R-G-B. Hence, the 8 corners of the cube represent the primaries red, green, and blue, plus the secondaries cyan, magenta and yellow, plus black and white. The cube can be viewed in Figure 7.11. Figure 7.11: The RGB color cube.